44 states and the District of Columbia have measures subjecting abortion providers to legal restrictions not imposed on other medical professionals. Unable to comply with these medically unnecessary and often far-reaching laws, clinics have taken their fight to the courts. 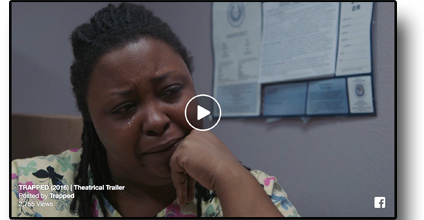 TRAPPED — the 2016 Sundance Film Festival Award-winning documentary that takes viewers to the front lines of the fight to keep abortion safe and accessible — is coming to Los Angeles' Landmark Theatre, beginning March 4. "Riveting, powerful, and timely as hell." TRAPPED's release coincides with events that could affect reproductive rights for generations to come. 288 new restrictions to abortion care have been enacted by states since 2010. The laws ban certain procedures, regulate providers and even limit insurance coverage. In March, the Supreme Court will hear arguments in Whole Woman's Health v. Hellerstedt — a case that argues the constitutionality of a far-reaching Texas law that dramatically restricts abortion access. TRAPPED is headed to theaters this spring. We're also working with organizations to host screening events across the country. According to a recent Politico poll, roughly 70 percent of registered American voters believe the government should not restrict abortion access. Want to connect with the filmmakers? Click here.